In the early 1990’s, new lumber design values were approved for all major softwood lumber species in North America. 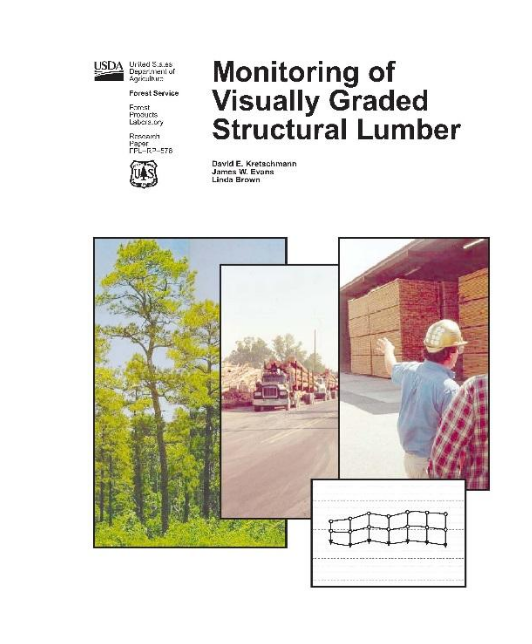 This testing program was known as the “In-Grade Testing Program” because each piece of lumber tested was required to be precisely of the grade being tested. The design values were based on tests of full-size pieces of lumber, which represented a significant departure from the previous basis for determining design values. For the In-Grade testing program, two grades (No.2 and SS) in three sizes (2×4, 2×8 and 2×10) were tested in three strength modes: bending, tension, and compression. Two new ASTM standards were written to specify the testing procedures (ASTM D4761) and the analysis procedures (ASTM D1990) to determine the new design values. Also included in ASTM D1990 was a paragraph stating that additional testing might be required if there was reason to believe that the resource had changed. SPIB took this paragraph very seriously and worked with staff at the USDA Forest Products Lab to develop a program to monitor the southern pine resource. In fact, beginning in 1994, an annual testing program took place at mills producing southern pine lumber. In this initial program, a piece of portable testing equipment was taken to southern pine producing mills and nondestructive tests were conducted to evaluate the stiffness of a sample of No.2 2×4 lumber. Procedures to determine which mills were selected and how many pieces to be tested from each mill mimicked the procedures used in the original In-Grade Testing Program. The monitoring program that evaluated stiffness continued annually until 2010 when separate, unrelated tests indicated there might be cause for further exploration. When additional tests were performed to destructively evaluate bending and tension strength of No.2 2×4, it was observed that some strength values were lower than expected. Therefore, in 2011-12, the full In-grade testing program was repeated for southern pine lumber. Because the ASTM standards were already in place to direct this sampling, testing, and analysis, this testing was conducted in a most timely manner. The results indicated that revised design values should be developed for southern pine lumber. These values were adopted in 2013 and have also been included in the 2015 National Design Specification. SPIB has since altered their monitoring program to include destructive testing. Because the equipment required for destructive tests is not portable, the lumber samples are delivered to the SPIB testing facility in Pensacola, FL. Again, the selection of the mills and number of pieces to be tested from each mill mimic the procedures used in the full In-Grade testing program. The Southeastern United States was divided into relatively homogeneous regions, where topography, climate, etc. were quite similar. Each region is sampled proportionate to the overall production from the region. The sampling of mills and lumber selection is a joint effort of the Southern Pine Inspection Bureau and Timber Products Inspection, so the vast majority of southern pine producing mills are represented and eligible for participation in the program. The most likely size/grade combination that might see a change in strength values is the No.2 2×4 combination, so that size/grade is tested the most often. Additionally, based on the recommendations of the SPIB Technical Committee and the SPIB Board of Governors, a sample of No.2 2×8 is tested, but somewhat less frequently. The samples are tested for either bending or tension strength. Since the publication of the 2013 design values, the monitoring samples have given a strong confirmation that the published values are appropriate and no changes are required. SPIB is committed to monitoring the southern pine resource and making sure that the published design values are appropriate. SPIB has been and will continue to be proactive in testing and monitoring the southern pine resource.